Join Northern Nevada HOPES for Nevada’s Big Give on March 21! Go to HOPES’ Big Give page right now to make a donation. Hope Springs fills a critical gap in the housing continuum, improving lives by providing emergency bridge housing and high-quality support services to our unsheltered neighbors. The community contains 30 individual units, on-site case management, and linkage to health care and supportive services. With your help, we can meet our goal to raise $6000, enough to build one individual shelter for a person experiencing homelessness, by donating now! 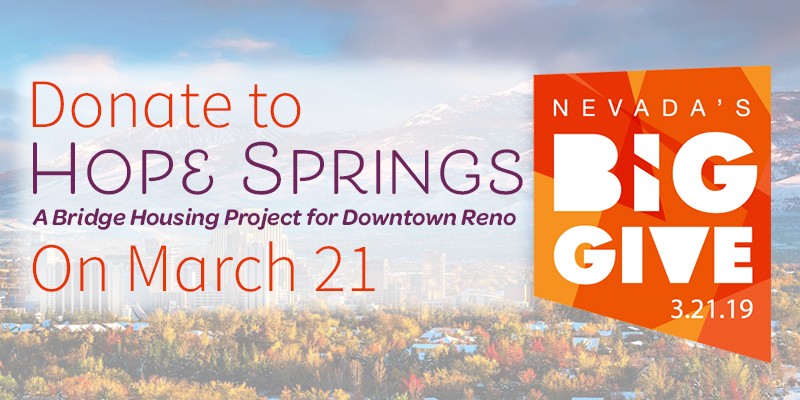 Together, we can create a resource in our city that uplifts our fellow Renoites and demonstrates to the world that Reno is a place of caring, compassion, and community. Donate to Hope Springs Today!